These super handy direct links allow parents direct access to purchasing, volunteering and confirming their data without having to login. Their account ID is built-into the link so the system will know who they are and take them directly to their own private page. They will not be sent to the complete directory system, only the area associated with the link. Store : this link will take a parent directly to the store and any purchases used with this link will be automatically credited to the family's account. The link is unique to the family that is tied to the email that the message was sent to. Click here to learn more. Signups: inserts a link to the parent's personal signup page where they can signup for activities and view their current commitments. Data Confirmation: inserts a link directly to the family's information for data confirmation. Tip (NEW Feature! ): Options are for inserting a Short Text Link, Button or Long URL Link. Try each one and send yourself the email to see what works best for your message. Enter into the message area of your email. Make your selection. The link or tag will automatically update with personal information at the time emails are sent. Note: You can only use one "type" of link. 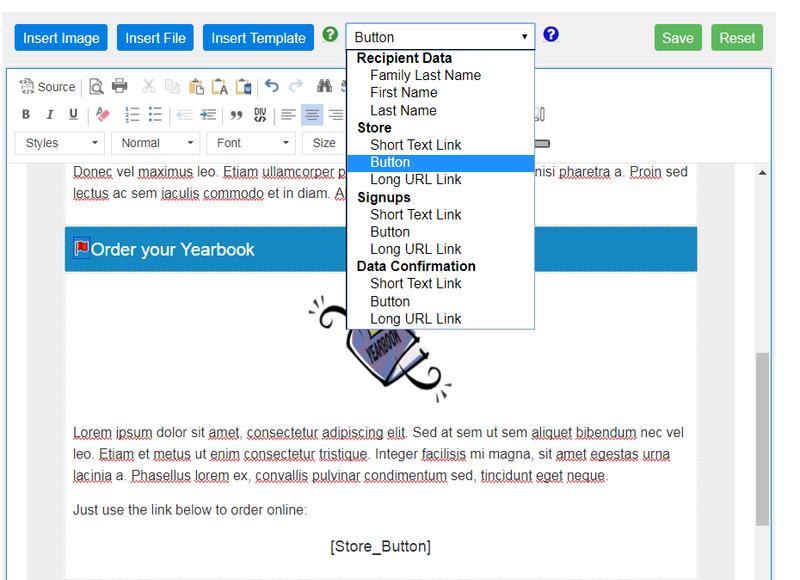 For example you cannot have both a store Short Text Link and a Button in the same message. Select the option from the dropdown. Here is what that email looks like to the recipient when using the Store Button.